Baked potatoes have a rather poor reputation when it comes to diet and weight loss, especially among individuals who are trying to reduce their total carbohydrate intake. However, you might be surprised to find out just how nutritious a baked potato actually is — and how well it can fit into your weight loss plan. When it comes to healthy carbs, you can't go wrong with potatoes. One large baked russet potato contains about 278 calories. The baked potato calorie count includes the potato skin, but not any added butter or other toppings. A plain baked potato contains very little fat, and does not contain any cholesterol. A potato only contributes only 1 percent daily value for sodium, or 30 mg. There are about 63 g of carbohydrates in a large baked potato. Much of these carbs in potatoes come from starch, giving potatoes a high glycemic index of over 70, reports the American Diabetes Association. For people who have diabetes or who are following a low GI diet, potatoes could cause a large increase in blood sugar levels. Important for building muscle and help heal your body from injuries, a potato contains about 7.5 g of protein, or roughly 15 percent DV. Potatoes are a good source of dietary fiber with 6.6 g, which is about 26 percent of your recommended daily fiber intake. Fiber is beneficial to weight loss because it can increase satiety and decrease hunger. Your body needs fiber for a healthy intestinal tract and regular digestion. Baked potato is an excellent source of vitamin C, providing about 48 percent of the daily value. Vitamin C helps with growth, development and repair of all body tissues. The B-group of vitamins are the building blocks of a healthy body and have an impact on your energy levels, cell metabolism and brain function. Baked potatoes contribute lots of B vitamins — 46 percent of your DV for vitamin B-6, in addition to thiamine, riboflavin, niacin, pantothenic acid and folate. Furthermore, potatoes contain vitamins A, E and K in smaller amounts, according to SELFNutritionData. Potatoes excel as a good source of potassium — offering more than a banana — with 1600 mg or 46 percent of your daily value to help maintain normal heart rhythm. Eat potatoes for the 33 percent DV for manganese to promote normal brain and nerve function. In addition, you will benefit from 21 percent DV for both magnesium and phosphorus. Other minerals in the healthy potato are iron, calcium and copper. Together, these nutrients aid in energy metabolism, support the health of the nervous system, help build strong teeth and bones and are essential for the production of red blood cells. In the vast majority of cases, the negative dietary elements in a baked potato are primarily not from the potato itself, but rather from the toppings that are put on it. 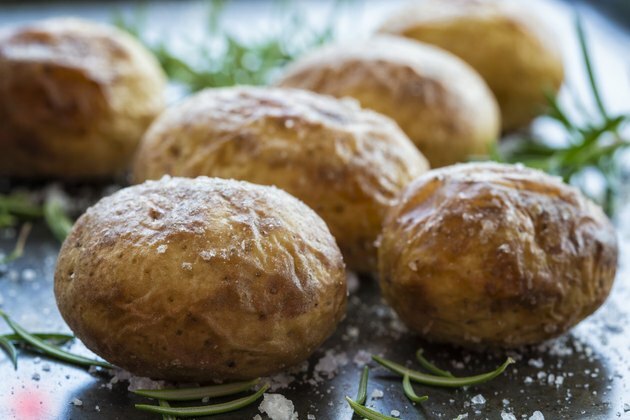 For example, a baked potato with butter and sour cream contains 470 calories, with 18 g of fat along with added cholesterol and sugar says NutritionIX. A Wendy's baked potato with cheese contains 479 calories, and 17 grams of fat. When choosing your topping, consider some low-fat alternatives such as cottage cheese, chopped veggies, yogurt or creamy horseradish. Although potatoes are healthy, be warned that green potatoes are not. They contain glycoalkaloids, a potentially toxic chemical compounds found in nightshade plants. Glycoalkaloids are formed when potatoes are exposed to light and produce chlorophyll, causing them to turn green. Don't eat potatoes that show damage, such as sprouting, greening or bruising. Some symptoms of glycoalkaloid poisoning from potatoes are a burning or bitter taste and flu-like symptoms, including abdominal cramping, nausea, diarrhea and vomiting, warns Government of Canada.